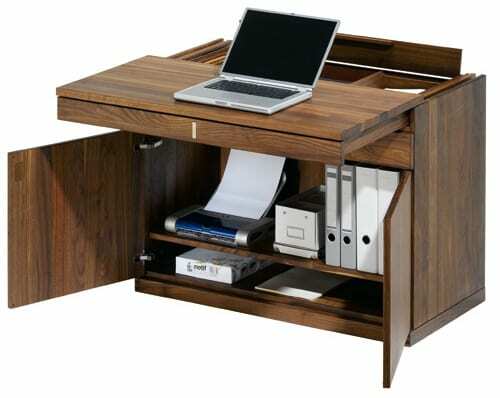 Small space home office furniture is on the rise as much as the smaller more efficient computer hardware is. Team 7’s “all in one” computer workstation features extending work top and hinged cover lid, integrated wire management channel for cables, and a removable organizer tray which reveals a hidden storage compartment. The best thing about this little computer desk is how unassuming and nice it looks when closed up. Team 7 has made a real stance in non-toxic and formaldehyde free furniture production made from a variety of real woods which are free from dangers of off-gassing commonly associated with furniture production today.